UPDATE (December 12, 2011): Just noticed there was something missing in the title. I added “Observations And”. This post examines the output of coupled ocean-atmosphere climate models used by the Intergovernmental Panel on Climate Change (IPCC) in their 4thAssessement Report (AR4) to substantiate their belief that Carbon Dioxide and other anthropogenic forcings have been the dominant causes of the rise in Global Surface Temperatures over the past Century. Climate scientists can only confirm that attribution with climate models, but that raises the question: Do the climate models employed by the IPCC actually confirm or contradict their hypothesis? The answer might surprise you. For those who have read my post The IPCC Says, “The Observed Patterns of Warming…, And Their Changes Over Time, Are Only Simulated By Models That Include Anthropogenic Forcing” or who have watched my narrated video included in the post The IPCC Says… – The Video – Part 1 (A Discussion About Attribution)this post will be familiar. I have simply presented a little differently, so if you have studied either of those two posts, you may wish to scroll down through the illustrations and section headings. You will find new information. There are five quotes that are germane to the following discussion. One quote is from the website RealClimate, which is self described as “Climate science from climate scientists”, and four quotes are from the IPCC’s 4th Assessment Report (AR4). I’ll illustrate those quotes with graphs of the observational and model data used by the IPCC that is readily available to the public through the KNMI Climate Explorer. Anyone with a basic knowledge of spreadsheet software, if they were to take the time, can replicate the graphs in this post. 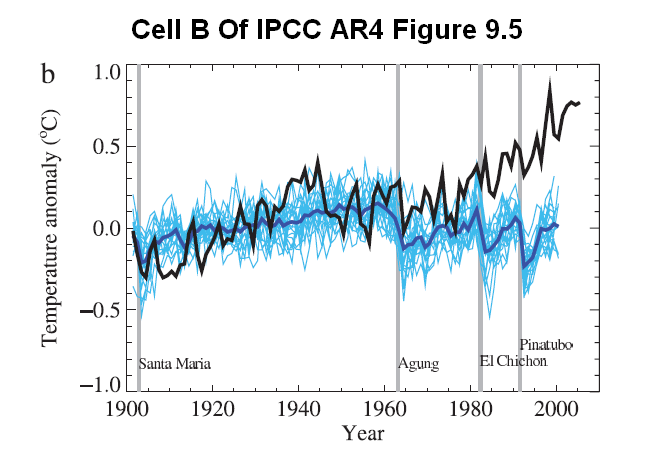 Cells A and B of the IPCC Figure 9.5 are presented here as Figures 1 and 2. For a detailed description of those graphs, see here. 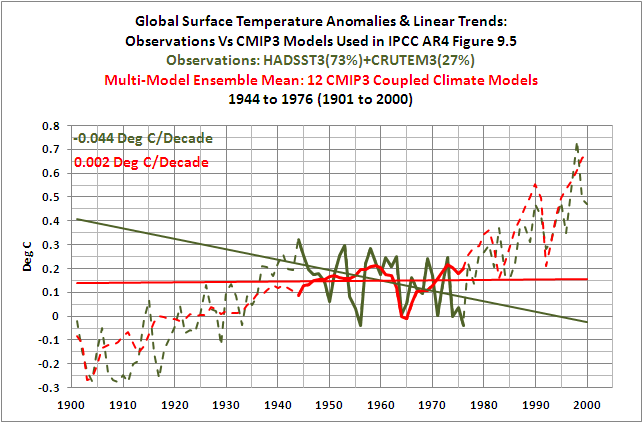 The IPCC obviously provided Figure 9.5 as evidence that observational and modeled data support their claims. Referring to Figure 1, they’ve shown instrument-based global land plus sea surface temperature anomalies from the HADCRUT3 dataset in black. They surrounded the variations in the observed data with the noise of the individual climate model ensemble members, with the yellow spaghetti. And the IPCC has shown their best-guess estimate of the natural and anthropogenic-forced component of the rise in Global Surface Temperatures with the Multi-Model Ensemble Mean, the red curve, which mimics, at times, the long-term and short-term variations in Global Surface Temperature anomalies. Those quotes and illustrations seem to support the IPCC’s hypothesis about CO2 and other anthropogenic forcings. But looks can be deceiving. The IPCC has loosely defined the warming and flat temperature periods. That fact should help minimize any claims that I’ve cherry-picked the start and end years I’ve used in the linear trend comparison graphs that I’ve presented later in the post. 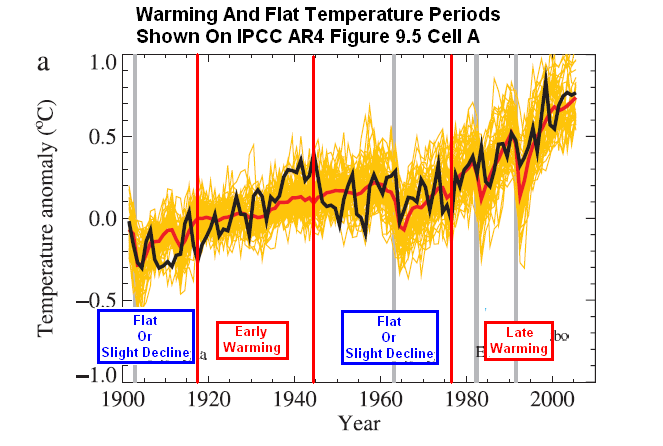 In Figure 3, I’ve marked up the IPCC Figure 9.5 to show the warming and flat temperature periods. Based on the HADCRUT3 data the IPCC used in the Figure 9.5, the years that mark the change from the flat temperature periods to warming and vice versa are 1917, 1944, and 1976. “Moderately good agreement”? 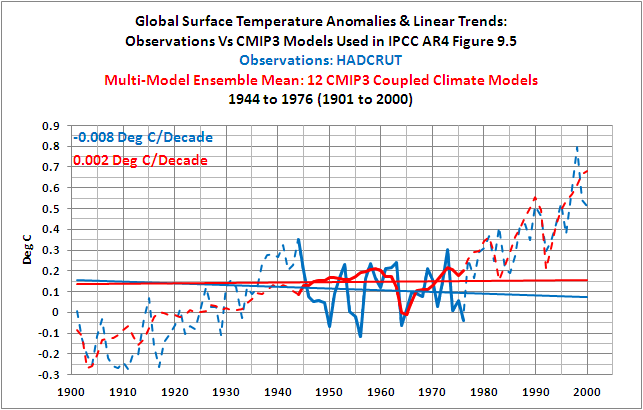 The IPCC could not have written anything much vaguer than that, while still putting the models in a positive light. But the obvious intent of the sentence is to reinforce how well the models agree with observations during the first half of the 20thCentury. “Good” is the key word. But scroll up to Figure 3. It sure does look like the Global Surface Temperatures warm at a much faster rate than the model mean during the early warming period of 1917 to 1944. In other words, the trend of the forced component during that period was only about one-third the actual trend of the rise in observed surface temperatures. To say that the models are in “moderately good agreement” with observations during that period is an overstatement, to put it nicely. And it also looks like the observations warm in the early and late warming periods at rates that are very similar. If anthropogenic forcings are the dominant cause of the rise in global temperatures, why didn’t temperatures in that late 20thCentury warming period warm significantly faster than they did in the early warming period? 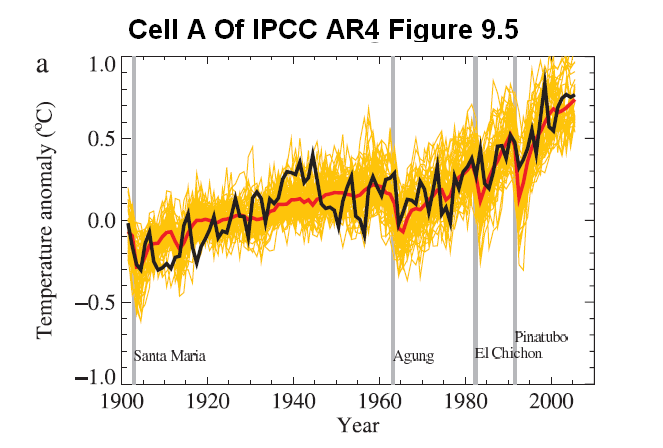 Climate modeling groups submitted the results of their modeling efforts to an archive for use by the IPCC for AR4. The archive is known as the CMIP3, standing for Phase 3 of the Coupled Model Intercomparison Project. And the 20th Century hindcasts were known as 20C3M. 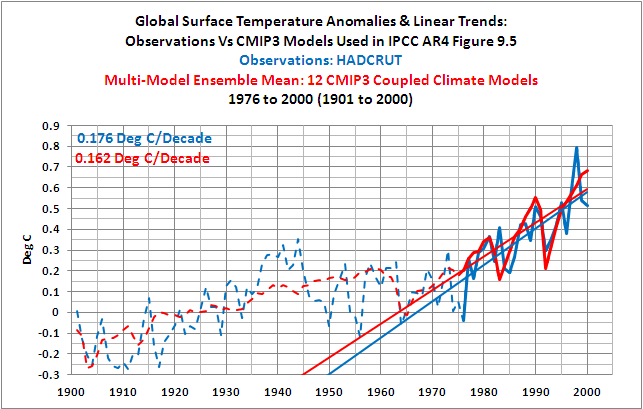 For their comparison graph of observed global surface temperature and model outputs, Figure 9.5 cell a, the IPCC did not use all of the 20C3M models available in the CMIP3 archive. They used twelve, including CCSM3, ECHO-G, GFDL-CM2.0, GFDL-CM2.1, GISS-EH, GISS-ER, INM-CM3.0, MIROC3.2(medres), MRI-CGCM2.3.2, PCM, UKMO-HadCM3, and UKMO-HadGEM1. Many of the listed climate models consisted of multiple ensemble members. For example, the GISS-ER hindcast of the 20th Century included 9 ensemble members. The same held true for the 12 models the IPCC excluded; some included multiple ensemble members. The CMIP3 climate models (20C3M) excluded from Figure 9.5 cell a are the BCC CM1, BCCR BCM2.0, CGCM3.1 (T47), CGCM3.1 (T63), CNRM CM3, CSIRO Mk3.0, CSIRO Mk3.5, GISS AOM, FGOALS g1.0, IPSL CM4, MIROC3.2 (hires), and ECHAM5/ MPI-OM. The IPCC provides further information about the models in their Supplementary Materialfor Chapter 9. However, there is another very obvious reason those models were excluded. It’s visible when the Multi-Model Ensemble Mean of the models that were included is compared to the mean of those that were excluded. Refer to Figure 4. The excluded models are missing the majority of the dips and rebounds associated with volcanic eruptions. Assuming these models did not use volcanic aerosols as a forcing, the IPCC was wise to exclude them from the ensemble mean. Without the dip and rebound associated with the eruption of Agung in 1963, for example, the models that excluded the volcanic aerosols would not have produced a flat or slightly negative trend during the period of 1944 to 1976. See Figure 5. And that would have impacted how well the models matched the observations during that period. Base Years: The IPCC used the base years of 1901 to 1950 for Figure 9.5. The same base years were used for the data presented in the following. Last, the majority of the 20th Century hindcasts only provided data as far as 1999 or 2000, but the AR4 Figure 9.5 included data through 2005. The IPCC, as they explained, spliced on the corresponding projections from the Climate Models, where they were available. I have not spliced on the projection data in the following graphs to extend the model mean data through 2005, since our primary interest is the early warming period. I have ended the data in 2000. 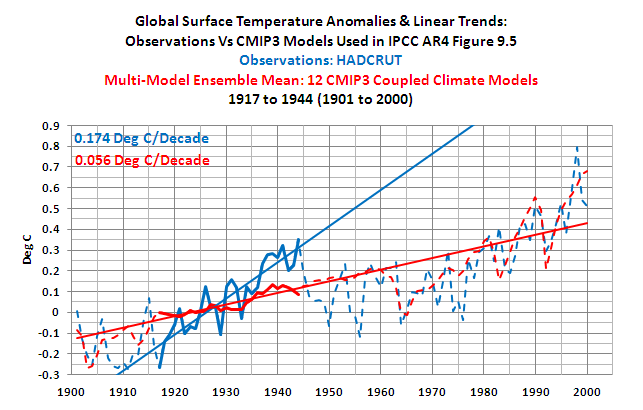 If that concerns you, refer to the graphs presented in The IPCC Says… – The Video – Part 1 (A Discussion About Attribution). My ending the data in 2000 in this post makes little difference to this discussion. 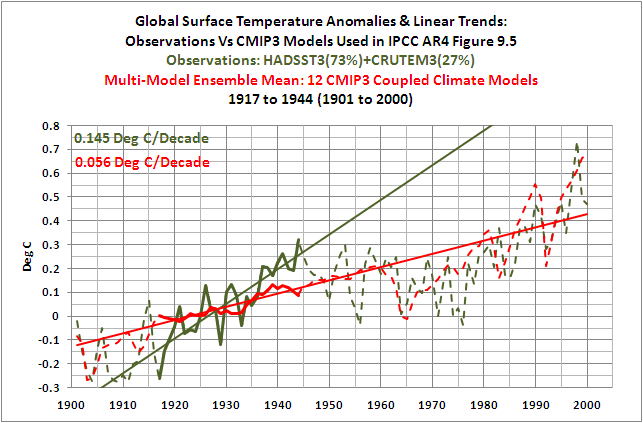 And the IPCC data confirms that the models can produce temperature trends similar to those observed during the mid-20thCentury flat period and late warming period. 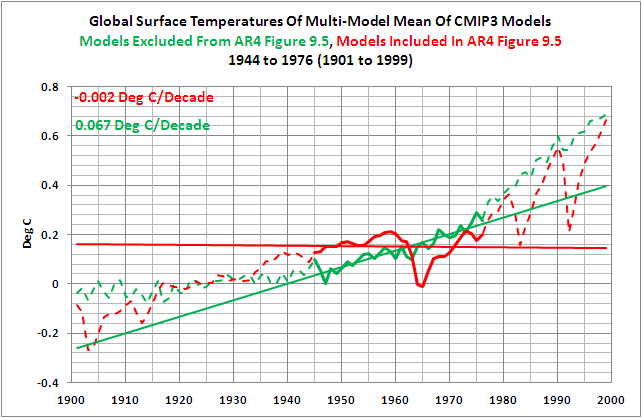 Figure 6 compares the linear trends of the observed global surface temperature anomalies and the forced component of the CMIP3 models used by the IPCC in Figure 9.5 of AR4 during the later warming period of 1976 to 2000. As discussed earlier, the multi-model ensemble mean represents the (naturally and anthropogenically) forced component of the outputs of the CMIP3 climate models the IPCC selected for use in their Chapter 9 hindcast comparisons. The IPCC described this period as “fairly linear upward trend,” and other than the volcano and ENSO wiggles, that’s a reasonable portrayal. The observations warmed at a slightly faster rate than the model mean during this warming period, but the linear trend of the forced component of the models is quite similar to the observed trend. Now we’ll look at the period described by the IPCC as “leveling out or even a slight decrease until the 1970s.” See Figure 7. The forced component of the models and the observations both have flat to slightly negative linear trends for the period of 1944 to 1976. 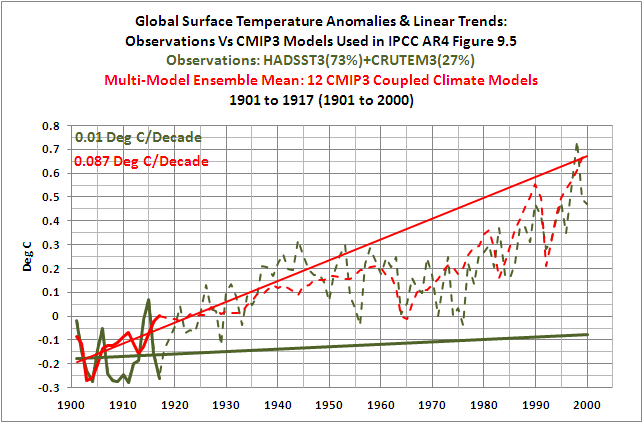 Unfortunately for the IPCC, those latter two periods are the only two where the models seem to match the observations. The forced component of the climate models only rises as a rate that is about 32% of the observed trend in Global Surface Temperatures during the early warming period of 1917 to 1944. See Figure 8. The IPCC acknowledges that the early warming period exists, yet the forced component of their models (the model mean) does not produce a warming at a rate that is anywhere near to the observed rate. This illustrates that global surface temperatures are capable of warming at a rate that is three times higher than the forcing. Or, viewed another way, the unforced component of the rate of rise in global surface temperatures can be twice as high as the forced component, assuming the unforced component is equal to the difference between the linear trend of the model mean and the trend of the actual rise in surface temperature anomalies. 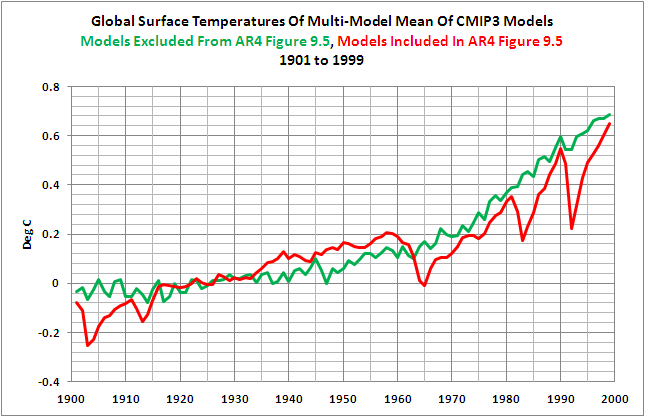 Figure 9 shows how the models fail to capture the cooling that took place in the decade-plus period of 1901 to 1917. The linear trend of the observations is negative during this period, but the trend of the forced component of the models is relatively high, second only to the trend of the late warming period. Modelling studies are also in moderately good agreement with observations during the first half of the 20th century when both anthropogenic and natural forcings are considered, although assessments of which forcings are important differ, with some studies finding that solar forcing is more important (Meehl et al., 2004) while other studies find that volcanic forcing (Broccoli et al., 2003) or internal variability (Delworth and Knutson, 2000) could be more important. Meehl et al (2004) “Combinations of natural and anthropogenic forcings in 20th century climate” used the obsolete Hoyt and Schatten TSI reconstruction for their solar forcing. This disqualifies Meehl et al (2004) as a credible reference for what caused the warming during the first half of the 20th Century. Basically, the Hoyt and Schatten Total Solar Irradiance (TSI) reconstruction was created to explain the warming during that period, so it comes as no surprise that a climate study using the Hoyt and Schatten TSI reconstruction would find solar to be an important factor in the warming that took place then. Figure 10 is from the post IPCC 20th Century Simulations Get a Boost from Outdated Solar Forcings. (That post was also cross posted at WattsUpWithThat, where you can refer to the comments by Dr. Svalgaard, who is a Solar Physicist from Stanford University.) In Figure 10, the TSI reconstructions were scaled assuming the solar cycle amplitude for the last three complete cycles was approximately 1 watt/meter^2, and that those variations caused a 0.1 deg C variation in Global Surface Temperature. 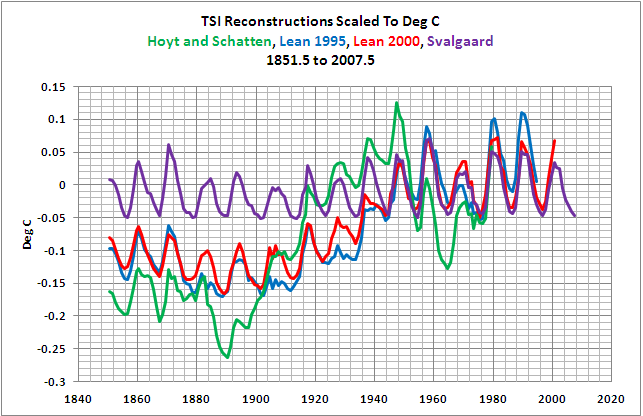 It is very obvious that the Hoyt and Schatten reconstruction also attempted to explain part of the flattening or decrease in temperature during the mid-20th Century with their dataset. And to further disqualify Solar forcing as the cause for the early 20th Century warming, the current understandings of solar variability are leaning toward the possibility that there has been no change in solar minimum, as represented by the Svalgaard data; that is, there are indications that the upward trend in Total Solar Irradiance in the early part of the 20thCentury does not exist. Additional confirmation of that in a few moments. The addition of natural forcings bring the trends during these shorter periods into better agreement with the observed record, with solar forcing the key addition during the 1900–1940 period and volcanic forcing the more important contributor from 1940–1997. If the simulated variability and model response to radiative forcing are realistic, our results demonstrate that the combination of GHG forcing, sulfate aerosols, and internal variability could have produced the early 20th century warming, although to do so would take an unusually large realization of internal variability. A more likely scenario for interpretation of the observed warming of the early 20th century might be a smaller (and therefore more likely) realization of internal variability coupled with additional external radiative forcings. In other words, Delworth and Knutson (2000) conclude that is more likely the forcings could be incorrect, blaming the rise on some additional unknown forcings. To sum up this section, the IPCC cited an inconclusive reference, Delworth and Knutson (2000); they cited a reference incorrectly and one that used as obsolete Total Solar Irradiance dataset, Broccoli et al (2004); and they cited a reference that incorporated an obsolete Total Solar Irradiance reconstruction, Meehl et al (2004). Another possibility is that the trend of the observations is too high during the early warming period of the 20th Century. This appears to have been one of the Hadley Centre’s considerations when they revised their Sea Surface Temperature data recently, because the early warming period trend of the HADSST3 data is less than its predecessor, HADSST2 data. The Hadley Centre’s SST dataset update was discussed in the post An Introduction To The Hadley Centre’s New HADSST3 Sea Surface Temperature Data. The HADSST3 data was presented in a two-part Kennedy et al (2011) paper Reassessing biases and other uncertainties in sea-surface temperature observations measured in situ since 1850, part 1: measurement and sampling uncertainties AND Reassessing biases and other uncertainties in sea-surface temperature observations measured in situ since 1850, part 2: biases and homogenisation. Let’s see what impact the changes from HADSST2 to HADSST3 would have on the model-data comparisons. Keep in mind, the changes also significantly impacted the mid-century flat period. It would not be considered flat with the HADSST3 data, because the Hadley Centre corrected for the 1945 discontinuity found in the paper Thompson et al (2008), Identifying Signatures of Natural Climate Variability in Time Series of Global-Mean Surface Temperature: Methodology and Insights. The HADSST3 data lowered the combined land-plus-sea surface temperature observations slightly during the late warming period, Figure 11, so that they are a little more in line with the forced component of the models during this period. The correction of the discontinuity in 1945 in the HADSST3 data plus the additional changes during the period of 1944 to 1976 have now caused a significant negative trend in the observations-based data. See Figure 12. The linear trend of the forced component of the models is now overestimating the rise in Surface Temperature anomalies by a significant amount, approximately 0.046 deg C per decade. These HADSST3 corrections, assuming they themselves are correct, show that the global surface temperatures are also capable of declining at a rate that is not projected by the forced component of the models. And in Figure 13 we can see the impact of the HADSST3 corrections on the linear trends of the observational data for the early warming period of 1917 to 1944. Instead of the combined land-plus-sea surface temperature anomalies rising at a rate that was 3 times higher than projected by the models, the HADSST3 corrections have lowered the difference so that the observations are now rising at a, still significant, rate that’s 2.6 times higher. 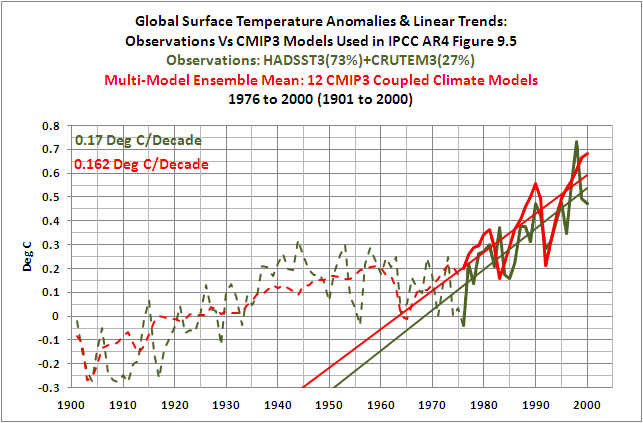 The difference between the observed and the model mean trends is still about 0.09 Deg C per decade. That’s a major difference when one considers that the trend of the observations data (CRUTEM3+HADSST3) from 1901 to 2000 is only 0.057 deg C per decade. And the HADSST3 corrections also decreased the difference between the observations and the forced component of the models during the period of 1901 to 1917. Refer to Figure 14. Instead of a 0.1 deg C per decade trend difference between the models and the HADSST2-based combined land-plus-sea surface temperature observations, the trend difference is 0.077 deg C per decade with HADSST3 corrections. But again, that difference is significant. The HADSST3 Sea Surface Temperature anomaly data, when combined with the CRUTEM3 data, actually cause the forced component of the models to fall out of apparent agreement with the observations for another epoch. When HADSST2 serves as the Sea Surface Temperature data source in a combined land-plus-sea surface temperature dataset, the forced component of the models is in reasonable agreement with observations during the mid-20th Century flat temperature period and the late warming period. But with HADSST3 in its place, the forced component of the models only appears to agree with the observations during the late warming period. That might leave some with the impression that the climate models used by the IPCC in AR4 were tuned to match HADCRUT3 data during the last half of the 20thCentury. The observed linear trends of the instrument-based global temperature anomaly data during the early and late warming periods are basically identical. Based on the HADCRUT data, the linear trend of the early warming period of 1917 to 1944 (Figure 8 ) was 0.174 deg C per decade, while the trend of the late warming period of 1976 to 2000 (Figure 6) was 0.176 deg C per decade. Yet the trends of the model mean, which represents the forced component of the IPCC models, are significantly different during the two warming periods. The trend of the forced component of the models during the latter warming period was about 2.9 times greater than the early warming period trend. In other words, the increase in anthropogenic Carbon Dioxide and other forcings during the late warming period caused the modeled trend to be 2.9 times higher in the late warming period than they were in the early warming period, but there was no change in the rate at which observed temperatures actually rose. Even more basically, the observed trends in global surface temperatures during the early and late warming periods, because they are the same, do not support the hypothesis of anthropogenic global warming. I would have liked to have included additional comparisons, but this post is long enough as it is. In part 2, using the “ENSO fit” and “volcano fit” data from Thompson et al (2008), we’ll adjust the observations and the model mean data to determine their impact, if any, on the trend comparisons during the four epochs of the 20thCentury. In another set of comparisons, we’ll replace the HADCRUT observations with the mean of HACRUT3, GISS LOTI, and NCDC land-plus-ocean surface temperature anomaly datasets, just to assure readers the disparity between the models and the observations is not a function of the HADCRUT surface temperature observations dataset that was selected by the IPCC for use in their comparisons. And we’ll compare model projections and observations for global sea surface temperature anomalies, but we’ll extend both datasets back to 1880 to also see how well the forced component of the models matches the significant drop in global sea surface temperatures from 1880 to 1910. And I’ll be using the average SST anomalies of HADISST, HADSST2, HADSST3, ERSST.v3b, and Kaplan. I would have preferred to go back to 1870 to capture the entire decrease, but the HADSST2 data is very sparse before 1880 and some of the models only extend back to 1880 as well. For additional discussions that illustrate the failings of the climate models used by the IPCC, refer to the posts here, here, here, here, here, here, here, here, and here. 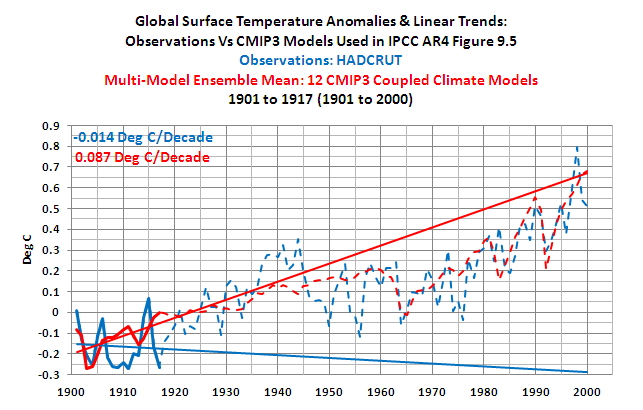 As illustrated and discussed in numerous posts at Climate Observations, the climate models used by the IPCC in AR4 show little skill at recreating the variations in global surface temperature over the 20thCentury. This post reinforces that fact. The IPCC, in AR4, acknowledges that there were two epochs when global surface temperatures rose during the 20th Century and that they were separated by an epoch when global temperatures were flat, or declined slightly. Yet the forced component of the models the IPCC elected to use in their hindcast discussions rose at a rate that is only one-third the observed rate during the early warming period. This illustrates one of the many failings of the IPCC’s climate models, but it also indicates a number of other inconsistencies with the hypothesis that anthropogenic forcings are the dominant cause of the rise in global surface temperatures over the 20th Century. The failure of the models to hindcast the early rise in global surface temperatures also illustrates that global surface temperatures are capable of varying without natural and anthropogenic forcings. Additionally, since the observed trends of the early and late warming periods during the 20thCentury are nearly identical, and since the trend of the forced component of the models is nearly three times greater during the latter warming period than during the early warming period, the data also indicate that the additional anthropogenic forcings that caused the additional trend in the models during the latter warming period had little to no impact on the rate at which observed temperatures rose during the two warming periods. In other words, the climate models do not support the hypothesis of anthropogenic forcing-driven global warming; they contradict it. NOTE: The Royal Netherlands Meteorological Institute (KNMI) recently revised the security settings of their Climate Explorer website. You will likely have to log in or registerto use it. For basic information on the use of this valuable tool, refer to the post Very Basic Introduction To The KNMI Climate Explorer. The HADCRUT3, CRUTEM3, and HADSST3 data are found at the Monthly observationswebpage of the KNMI Climate Explorer, and the model data is found at their Monthly CMIP3+ scenario runs webpage. Have you every tried recreating this planet from the models? Certainly not going to be an orb when you’re finished. Also the models miss vast time periods and MANY contributers to climate. Temperatures do not make a planet. Please clarify. Before you get too specific, though, I download data that’s readily available to the public from a number of sources, I plot it, and I present it. I create animations on occassion, but those are simply a series of maps or graphs that I throw into the GIF Movie Gear software. I keep my analyses simple so that anyone can recreate what I’ve done. Regarding the ”flat” and increasing temperature for the last century; doesn’t tell anything about the change in GLOBAL temperature; but about the ”honesty” about the people that were colecting / manimpulating the data. Increasing temperature ment = more dishonest people / flatening = more honesty. b] does anyone of them has the corect temperature for 123km NE of Easter Island for 13 / May 1934 at 11AM on 87m altitude?! Or, that is not on their globe? There is 15 times more atmosphere between Easter island and Fiji, than all of Europe and north America combined. If land gets warmer by one degree – over the oceans get colder by 0,5 degree = overall allways the same. Bob, the precursor of all evil is: refering to localised warming as GLOBAL; localised coolings as GLOBAL. The comenror above Joe’s World has hit the nail on the head. Do the protagonist know the tremendous damages they do by those intentional confusions? I think Joe’s World’s point is that there are many factors that are not included in models. The usual alarmist explanation is that the factors not included in models wouldn’t significantly affect the results. Dave is correct. It would not effect currently defined temperature. But it does effect the circulation, evaporation, precipitation, pressure, gravity, angles of solar penetration, tilting of our planet, etc. All the other areas that temperature data fails to cover. Joe’s World, I’ll leave the same message here that I left for you on the thread of part 2. I understand that temperature is not the only metric of global climate, but it is the most commonly referred to metric. And I also understand that climate models do more than create temperature hindcasts and projections. Regardless, how does your comment pertain to the inability of the models to recreate the global surface temperature record of the 20th Century? That’s what’s being discussed on this thread. Figure 9.5 of the AR4 has always struck me as peculiar. It graphs three sets of values that have radically different frequency content, making it well nigh impossible to compare them. The annual individual model outputs have the highest frequency, the summed or stacked model means have the lowest frequency content (since stacking always removes non-coherent high frequencies) and then the annual temperature observations are intermediary. It would make sense to compare the model means with temperature observations smoothed over ten years or so, but doing so would reveal the disconnect between the models and the observations in the first half of the 20th century. I am left to conclude that the failure to present comparable frequency content was merely a ploy to obscure the real comparisons. And the better accord between the models and the reality for the last half of the 20th century leaves me thinking that the models were selected and tuned to match that time period, while disregarding the effects those tweakings might have on matching the earlier time periods. Or for that matter the currently ending decade, wherein the models still “confidently” predict rapid increases while the observations show trivial (if any) net warming.